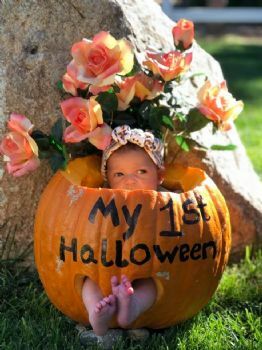 Just had to share with all of you the cutest pumpkin ever. This time next Saturday I will be on my way to meet her in person. Oh my gosh, is she not the cutest little pumpkin ever?! I'm sure you are anxious to meet her in person! Be sure to take pics while you are visiting so you can post them when you get back. Have a great trip!! She is absolutely precious! Have a wonderful week Barb! Cute pictures! Bet you can't wait to see her. Have a wonderful trip and spoil her terribly. Safe travels. The cutest decorated pumpkin EVER. So happy you're going to hold her! 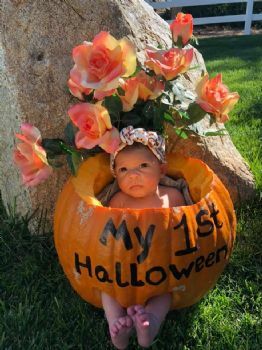 Now that IS a cute pumpkin! 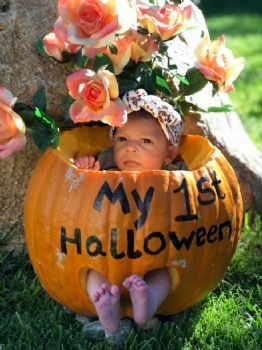 This is adorable but she doesn't looked thrilled to be sitting in a pumpkin! Enjoy your time with this little pumpkin next week! Hugs. How adorable! Have a great time when you finally get to meet her! Precious memories for sure. 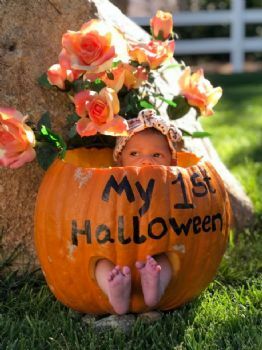 What an adorable little pumpkin! I'm so happy for you, and feel certain you'll shower this precious little girl with loads of love. Yep, U R right, a real cutie pie. Have a good one!